A single car accident at mile marker 132 west of Van Horn could have ended tragically if not for the heroic actions of a 9-year-old boy who was a passenger in the vehicle. 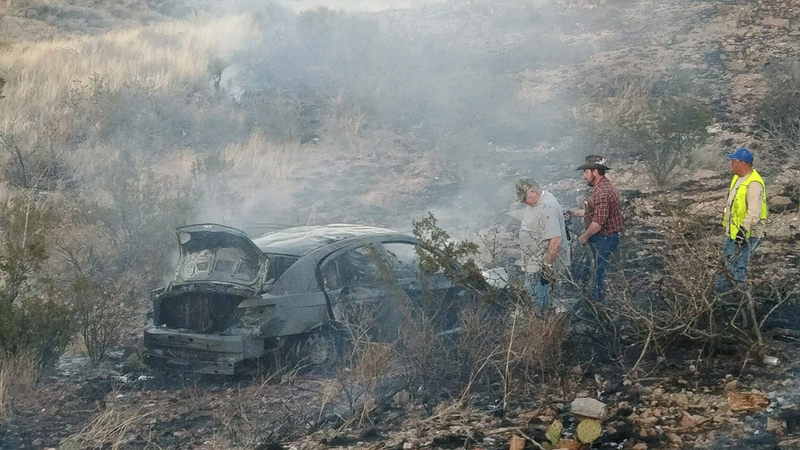 According to law enforcement officials, the driver of the vehicle, the boy’s mother, lost control of the car which erupted in fire after coming to a stop. The 9-year-old noticed that his mother was having difficulty getting out of the car and that his 4-year-old brother was still strapped in his car seat in the burning vehicle. Without a second thought for his safety, the older boy ran toward the car, helped his mother free his younger brother, and carried him to safety up a nearby embankment. Multiple rescue, fire and law enforcement agencies responded to the scene after a 911 caller reported the accident as a fire with the occupants still trapped inside. Luckily, no one was seriously hurt, largely in part to the quick thinking of the young hero. At press time, the names of the people involved were not available, but the Advocate was told that plans are underway to honor the young man at his school in El Paso.